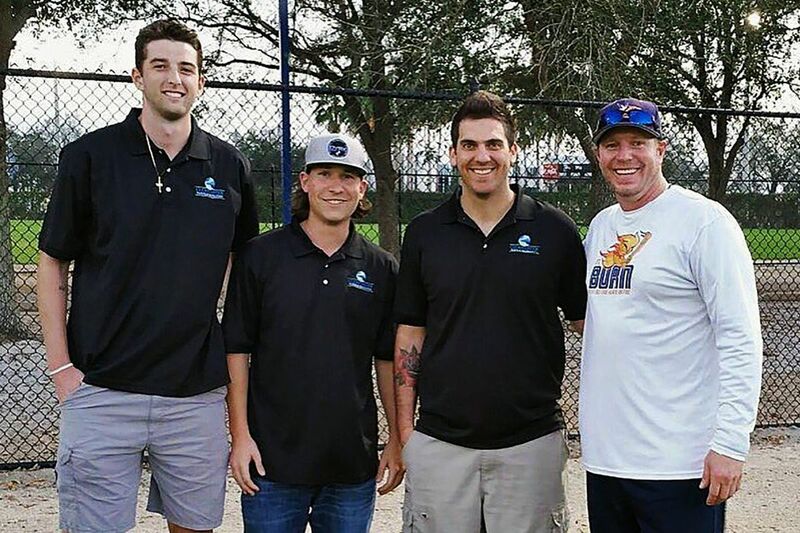 Roy Halladay (right) with (from left) Phillies minor leaguers Kyle Young and Jeff Singer and former minor leaguer Scot Hoffman. Roy Halladay stood Monday afternoon at the front of a conference room in Clearwater, Fla. He was there, on the second floor of the Phillies' Carpenter Complex, to lead a presentation for a group of minor-league players. He was there, roughly 24 hours before his death, to teach. The Phillies hired Halladay in March as a mental skills coach for the minor-leaguers who played and trained in Florida. He worked five days a week and had his own office, which included a massage chair. Baseball's mental side became Halladay's obsession after he resurrected his career in the early 2000s under the guidance of a sports psychologist named Harvey Dorfman. And now Halladay had the chance to spread his passion. Halladay met throughout the season with players both individually and in group sessions such as Monday's. He did not teach them his two-seam fastball but instead, how to tackle the mental challenges that lie ahead. "I was pretty star-struck at first," said Luke Leftwich, a 23-year-old righthanded pitcher who finished the season with high-A Clearwater. "But he was just so easy to talk to. He's one of the greatest pitchers ever, and he was just such a normal guy. It was really easy to want to talk to him." Roy Halladay on Monday, a day before he died, giving a lecture to Phillies minor-leaguers in Clearwater. The Phillies began courting Halladay four years ago, when he retired from playing. Ruben Amaro Jr., who had tried tirelessly to acquire Halladay before getting him in December 2009, hoped the pitcher would stay with the Phillies as a coach. Halladay, wanting to spend time with his wife and two sons, deferred. The pursuit continued as Scott Proefrock, an assistant general manager to both Amaro and Matt Klentak, kept in touch. A deal seemed close before the 2016 season, but Halladay, who coached his son's youth baseball teams, backed out. He finally joined the Phillies before last season, first as a spring training instructor and then as a mentee to Geoff Miller, who was hired four months earlier as the team's first mental-skills coach. "I've always been hesitant to entertain a former player without any formal education doing this kind of work," Miller said. "Sitting down with Roy, he really changed my mind about it. For a few reasons. One is the 13 years he spent with Harvey Dorfman. He knew Harvey's work forward and backward. I don't think many former players were that devoted to it. And the other piece is that he was so humble. He was very quick to recognize where his limits were in the work he was doing and to ask for help and seek additional knowledge. He was just so interested in helping others." Halladay's office sat just 500 feet from the clubhouse of the Clearwater Threshers, the Phillies affiliate in the Florida State League. He often walked through the clubhouse and sat at the lunch table in the middle of the room. "I don't know if he was just bored over there or just trying to make it seem like he was pretty approachable by being available," Leftwich said. "Like 'Here I am. I'm sitting at the table in your locker room. I am this available right now.' "
Halladay posted two sheets on the clubhouse bulletin board. One was to reserve his office massage chair. The other was to schedule one-on-one meetings. Halladay, a baseball great, had office hours. It was quite the opportunity. "I met with him four or five times," said Jeff Singer, a lefthander from South Jersey who grew up a rabid Phillies fan. "We would just talk about life. You could talk to him about anything, which was awesome. When you walked into that office, you didn't feel like you were going to meet Roy Halladay. It just felt like anyone else." Halladay ended each session by giving the player a set of two books by Dorfman, in whom he had immersed himself when Toronto demoted him in 2001 to single A after a historically rough beginning to his major-league career. Halladay gave each player a notebook and instructed each to jot down notes throughout the season, which they would then go over together during future sessions. Singer remembered watching Halladay's perfect game and no-hitter while dictating each play over the phone to his brother, who was away at college and could not watch. Then he sat in Halladay's office and told him how he had struggled to record the third out of an inning. Singer could retire two batters with ease,but then trouble often brewed. Halladay listened and gave Singer an exercise to clear his mind that he had used during his own career. "It was a block of 100 numbers and there's one number in each block. You had to go from 99 to one. Look for 99, cross it out. Look for 98, cross it out. 97, cross it out. All the way to one," Singer said. "He had me do that before the game, and it really cleared my mind and helped me get locked in. He told me his best score was 2 minutes and 35 seconds. He said he was awful his first time so it would be OK if I finished in six or seven minutes. My first time was 14 minutes, 20 seconds. He just started laughing." Leftwich scheduled monthly meetings with Halladay and found that they had similar upbringings. Halladay told the young pitcher about the external pressure he once felt to perform well to please his father. "And a big change for him was when he gave himself an internal look," Leftwich said. " 'Why am I doing this? I'm doing this because I love it. I'm not doing this just for them. I want to do this because I love it and this is what I want to do with my life.' We talked a lot about getting rid of external pressures and concentrating on what I can do internally to make myself better." Halladay's work continued after the season. He made a presentation last month during the instructional league about the challenges he overcame to get back to the majors after his demotion. He told the players to look around the room. Everyone, Halladay said, is talented, but it is your mental preparation that will set you apart. "You could see that he was talking from the heart," said Steve Noworyta, the team's assistant director of player development. "You could see that the players really related to him because he talked about the struggles and what it took to get back to where he was. It touched all of us. He touched those kids' hearts because he was genuine." "It was incredible. I walked in and I was like, 'That's actually you, Roy Halladay.' I'm not going to lie — I was nervous," said Luke Williams, a 21-year-old third baseman who spent the season with low-A Lakewood. "It's a conversation I'll never forget. I learned so much from him about preparing to be great. He said we need to figure out a plan. When you figure out a plan, write it down and instill that in your mind." Monday's lecture, the final lesson Halladay would give, was for a group of players from the Phillies' strength and conditioning camp. He geared his speech toward working out. He talked of how important it is to give a full effort in the gym when no one is watching. He told them how to battle the mental grind of spring training when the days become monotonous and you just want the season to begin. Halladay had made a PowerPoint presentation but neglected most of the slides, speaking freely for a half-hour about the intense dedication that made him successful. The players, most of whom were not yet in high school when Halladay pitched his postseason no-hitter, were in awe. "He was just giving us a piece of what helped him," said Connor Brogdon, a 22-year-old righthander drafted last June. "He said when he was coming up that there was always an argument of what came first: success or confidence? He said he found out it was neither. It was preparation that came first. I'll never forget that." Brogdon was in Spanish class on Tuesday — the Phillies offer language courses to their minor-leaguers at the Carpenter Complex — when he noticed a teammate on his phone. Brogdon gave him a look, but the player said he was monitoring something serious on Twitter. Another teacher then entered the room and broke the news: Roy Halladay, who just a day earlier had taught in the same building, died after crashing his plane into the Gulf of Mexico. "It was instant silence," Brogdon said. "We looked around at each other and were just at a loss for words. We all just packed up our things and left. We didn't even say a word." Halladay's time in this role was short. But his impact was large. The Phillies hoped that he would work with them for years. Maybe he would become their major-league pitching coach. Or perhaps he would stay in his Clearwater office with that massage chair. Halladay had so much more to give. "That's what [stinks] the most. He was such a good person, and the whole place looked up to him," Leftwich said. "It was so great to have him around. It will definitely be tough to go back for spring training and him not being there. We're a strong group, and I know we're definitely going to play in his honor."